Machaerus castle, where Salome danced. 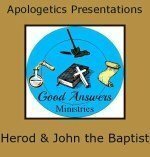 Christian apologetics materials from Good Answers Ministries and Dr. Gerald Culley. FREE Powerpoint files to download.